While it can be easy to overeat at a Thanksgiving feast, you can still provide a healthy dessert option for your family. When deciding on a dessert to make for Thanksgiving dinner, consider this Pumpkin Bread recipe. Did you know pumpkins are a great source of vitamin A, which helps support skin health? Don’t forget to show appreciation for your body every day by satisfying the daily recommended values. In a large bowl, beat together the oil, applesauce, eggs, pumpkin puree, sugar and water until well combined. In another bowl, whisk together the flours, salt, baking powder, baking soda and spices. Add the wet ingredients to the dry ingredients and mix well. Add the walnuts at the end, making sure to get all the ingredients incorporated from the bottom of the bowl. How did your Pumpkin Bread turn out? 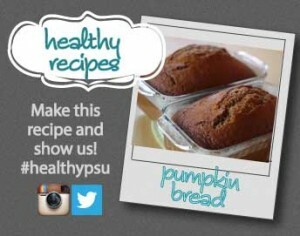 Share a picture on Twitter or Instagram with the hashtag #healthypsu and your photo could appear on our blog!